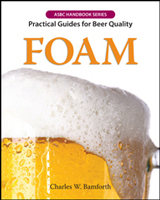 The fourth volume in a six-part series addressing quality of beer. Order the 4-book Series Set and Save! Over $50 Savings when you buy the set! What do beer drinkers look for in the clarity of their brew? If brightness is best, as traditionalists will argue, then what explains the current popularity of profoundly turbid beer? And what about color? In one experiment, individuals described the flavor of beer based on its color. Color matters—but how and why? Many factors affect color and clarity, and understanding them is key to producing beer that has the desired appearance every time. 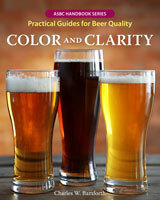 Color and Clarity, the newest installment in the ASBC series Practical Guides for Beer Quality, is the first comprehensive yet easy-to-read book to describe all of those factors. Author Charles W. Bamforth, who has been part of the brewing industry for more than 40 years, presents the science behind beer in a clear, fun manner. In his signature chatty, informal style, Bamforth takes readers through the complex nature of color and turbidity. 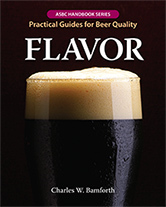 He explains how raw materials, processing, and packaging can impact color and clarity, enabling readers to think systematically and knowledgeably about ways to achieve the qualities they desire in their beer. He also offers straightforward guidelines on how to measure and interpret color and clarity, helping readers improve quality performance. Finally, he provides a wealth of useful references and links, directing readers to informative sources about methods and equipment. And of course, woven throughout the book are the author’s insightful and authoritative anecdotes. 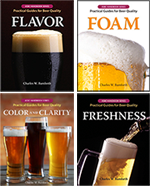 Like the other books in this series, Color and Clarity is a necessary guide for anyone who works in the beer business—from commercial brewers and suppliers to wholesalers and retailers. 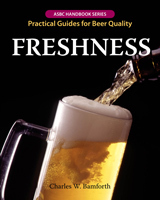 The book is also a user-friendly resource for those who study beer scientifically and those who brew it and drink it recreationally! 2. What Exactly Is Color?